Essential insights and support for those facing loss and grief. Wait. Is that how you say it? Does that even make sense to put it that way? and a host of other emotions that are blends or hybrids of these core ones. Pre-grieving, I was reading a lot of books on the topic. Dear Elisabeth Kübler-Ross was helpful, but I read her books with the knowledge that her perspective of grieving was one that several leading thinkers in the space have criticized. Given her belief that grief evolves through a series of stages and knowing that there were very few – if any, people I knew out there who were able to brush their hands together and say “OK. I’m done grieving. I’m all better, and I’ve accepted my loved one’s death,” it’s not as cut and dry as Ross believed. So in my quest to continue to develop my death positivity and my personal work with grief, I found a book that completely gets it right. 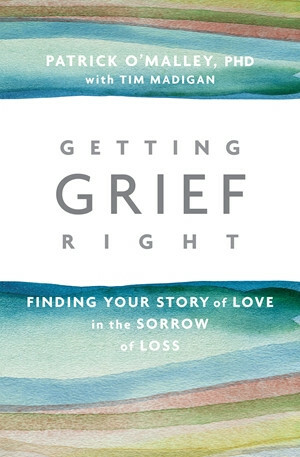 Getting Grief Right: Finding Your Story of Love in the Sorrow of Loss by Dr. Patrick O’Malley. Many of you may know Dr. O’Malley an article of his that received quite a bit of attention in the New York Times. It is a snapshot of the wisdom that he shares within the pages of this book. The author provides many helpful tips on how to cope in an effective manner. He offers many practical self-care suggestions and recognizes the value in ensuring that people take good care of themselves during this time of their lives. The concept of self-knowledge and one’s individual psychology and historical background is also paramount in Getting Grief Right. So many of these reactions from others to what are our natural emotions can make us feel ashamed, weak and generally weird. Many of us are used to taking a goal-oriented approach to healing, and this simply doesn’t work for the grief process. It’s a giant let-down to realize that it’s always going to be around. You can’t do much to change the fact that your loved one is dead. You can’t let the opinions of others influence your personal experience of what’s occurring during this incredibly charged area of your life. This book is dedicated to examining your story as much as reviewing the stories you recall about the deceased. It also provides advice to support those who are grieving and offers suggestions for how you can encourage them to express their emotions and memories of their loved ones. Within the pages of this book, you’ll feel both understood and validated. Dr. O’Malley shares a great deal that relates to his personal experience of grief. Being a grief counselor who has direct connection with deep loss has helped him to help others. He offers the knowledge he’s gained from working with his clients and the personal work he’s done both with his own story, as well as in understanding the various concepts behind grief therapy. The author notes that “Our stories are pathways to living with loss” and this quote best exemplifies the approach he has taken with his patients. Getting Grief Right is for those who are looking to explore and write about the story of their loved one – and all of the emotions that surround the loss of this person in your life. It’s a way to unearth all of the memories and feelings around your relationship with those who have died and to unpack this information in written form. Writing may help you get the words out that you’ve struggled to find a way to express. Dr. O’Malley believes that having a safe space for allow you to tell your story is what helps people better understand their experience. It’s a tool to work towards making space for yourself and limiting your self-judgment. In addition, it helps you continue to honor your bond with the person who died – something that isn’t lost despite their physical absence. It’s a way to remember your experience of that person – the details of your relationship. It can help you construct meaning. This book is not going to erase your grief. It’s designed to help you examine it and develop the wisdom and compassion to relate to it in a different way that what we have been taught to as a society. Now you may be suffering from traumatic or complicated grief and I really wouldn’t encourage you to dive into this book without having a strong support system or giving some thought to speaking to a mental health professional before you really engage with the writing and contemplative exercises that are detailed in the book. I’m really looking forward to completing the writing exercises and actually starting a virtual group who wish to engage in a study group around the subjects covered within Getting Grief Right: Finding Your Story of Love in the Sorrow of Loss. While I greatly appreciated the knowledge that I gained from reading this book, I’m now anticipating the second phase of the brilliance of this work and doing the work to see where this kind of exploration takes me.